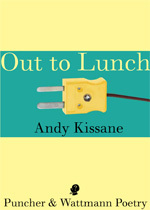 Among other things, Andy Kissane’s poetry in Out to Lunch focusses on suburbia, public transport, family, television, the beach and sausages. So, why am I surprised to be moved? And, not only moved, but challenged? That the visceral, emotional experience of this collection is accompanied by such a sense of surprise is to me a reminder of how much I have still unconsciously bought into the myth of novelty and obscurity. Kissane writes accessible, unpretentious, often humourous, subtly thoughtful poems. They use language that isn’t a long way from the vernacular, what you might overhear at the food court or the pub, eavesdropping. But it is a language carefully calibrated to heighten the sense of the momentous within the everyday. Not to eclipse the everyday, but to attend to it – something like the effect of a film slowing down, heightening the meaning of small gestures, glances and events. It is a deliberate effect, sure, but it’s entirely unforced and natural – as in “Visiting Melbourne”, these are poems seemingly “sung / by lungs that never pause to think of breathing”. This comes out intriguingly in “The Earlwood-Bardwell Park Song Cycle”, his ambitious and accomplished response to Les Murray’s “The Buladelah-Taree Holiday Song Cycle” (which Kissane rightly reminds us is itself a response to the Wonguri-Mandjigai Song-Cycle of the Moon Bone). Whereas Murray’s poem is an attempt to fuse Aboriginal storytelling with a European-Australian attachment to country attuned through annual holiday-making, Kissane takes a more modest and respectful tack. It contains something of the same grammatical structure and heightened attention to place, but it maintains Kissane’s characteristic clarity and light touch. His “Song Cycle” is the Australian suburban world as it is lived day to day. It begins “the long holiday is over”, and flows through all the regular movements of traffic, work, home, shopping, crime, birdlife, the small epiphanies gained and missed. Near its climax, the poem speaks “of the people who gave Gumbramorra Swamp / its name, the Gwiyagal people, who were here first and are still / here, who fished and lived and moved in this place, here”. In this, it is not only a revision but a critique of Murray’s epic reach, baulking at a presumptuous appropriation of an indigenous worldview. Most of the poems in Out to Lunch are structured in a taut and concentrated casual way, reminiscent of Robert Hass or Billy Collins, yet arguably even more deceptively casual. I say ‘deceptively’ because very often the sensation of a Kissane poem is of someone sitting beside you to tell you what has happened to them, and just as you’ve entered into that familiar world, something twists or jolts you into somewhere exhilaratingly unexpected, though on second glance intuitively connected. For instance, “Falling through the Hoop” contains a string of scenes and memories that touch on the life of “Heinz”. It moves from an image of skinny-dipping at Elwood beach, to “a suspension bridge across a ravine”, then to Heinz’s sudden suicide. At this point, Kissane, as he often does at moments like this in his poems, recedes into an admission of ignorance – “some moments / resist, no matter how you worry / at them, or pound them, they will not / answer, they will not come back”, aware that the reader will understand that these “moments” are also the people who he has lost. To me, this is one of the most intriguing aspects of Out to Lunch. Many of its best poems, while rooted in autobiographical specifics and a familiar suburban milieu, grapple honestly with the suffering of others, and with the limitations of that grappling. The poet is clearly aware of, and uncomfortable with, global inequalities, and acutely aware of the great distance between his own life and the lives of others. His poems apprehend political complexities through the very intimate lens of empathy and imagination. The very real dilemma of attempting to integrate global realities with daily routine is vividly evoked in “The Colour of Starvation”. Here, Kissane remembers watching as a teenager a documentary set “somewhere in Africa or India, where many people / were poor and starving” and his subsequent anger at his family’s material comfort, acknowledging how easily an awareness of the other slides into self-consciousness. The poem weaves this story into a meditation on William Morris, 19th century artist, textile designer and socialist; the poet’s desire to write about sweat-shop labour from the comfort of his desk; and the pleasures of food, beautiful objects and sunlight. The poem leads us towards a familiar, uncomfortable compassion and refuses to provide solutions. As these juxtapositions build through the course of the book, as a reader, I begin to want the poet to attempt some leap towards resolution or provocation, but Kissane eschews definitive answers in favour of the clarity of the poem’s evocation of reality. Or, to put it another way, he overtly recognises the relative impotence of the poem to directly affect injustice – thereby allowing it to have impact in the affective field. Throughout Out to Lunch there are small, concentrated statements of poetics, either implied or in the case of “Joy and a Fibro Shack” overt. The poem begins with an exploration of poetry as “like the difficulty of building a house / without a plan, a wood, a hammer”, moving further into the metaphor, until the deliberately prosaic lines “Is a poem a palace or a humpy? / I prefer humpies, furnished from a daggy couch / reclaimed from the council clean-up”. If this was the extent of the poem, it may feel underwhelming, but it shifts gear, as Kissane often does, through memory into a secondary metaphor that is just as clear and subtle, while also refusing resolution. It ends with the poet “up at 3am, / walking the kitchen, walking the hallway, walking / the lounge room, holding a baby / who would not stop, would not stop, / just would not stop crying”. We know that the poet is in control of this poem, but at its closure, we are left also with his awe at the wildness and hunger of poetry. The question is, what holds this collection together? How could it be said that these poems are out to lunch? This is perhaps my only serious qualm with the book – the title. The suggestion of daydreaming in Out to Lunch certainly alludes to the shifts and leaps which provide much of the energy and surprise of the collection. And it also hints at the “Meat Matters” series of poems, where meat in its various cuts and recipes is given centre stage (which is sometimes quite funny and memorable, but also left this vegetarian a little cold) . But the idiom to me is too much rooted in the negative or apologetic, bringing to mind someone who instinctively wants to escape from the everyday with their imagination, someone unconcerned with the world as it is and their responsibility to it. This is not Kissane. This, of course, is a minor issue. Kissane is a great craftsman, the writing finely shaped yet always fluid and naturalistic. Out to Lunch was deservedly shortlisted for the 2011 Kenneth Slessor Prize – the poems are warm, subtly complex and humane. Its peculiar and ongoing resonance comes from its full immersion in reality and memory, where moments of detail remind us of the constructed and limited nature of the poem, moments that foreground ignorance, that imply that life goes on through not knowing.